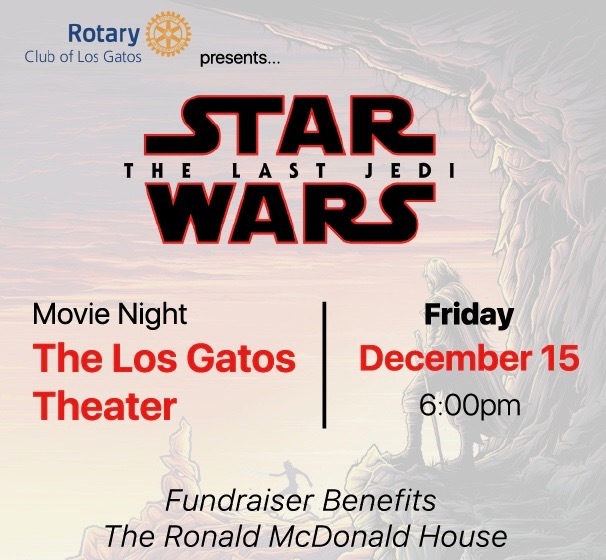 Rotary Club of Los Gatos raised $6,000 by purchasing every seat available in the Los Gatos Theatre Dec. 15, 2017 at 6pm for opening weekend showing of the movie Star Wars the Last Jedi. The club resold (214 seats) in approximately 2.5 weeks. All proceeds for this event benefit the Ronald McDonald House Stanford. Six movie seats were given away to two family staying at the Ronald McDonald House. All the participants were invited to join us for happy hour at Gardino’s Restaurant for some fellowship before the movie started.